Here is a list of the average salaries of college football coaches for all the FBS conferences. That includes the Big Ten, SEC, ACC, Big 12, PAC-12, AAC, Mountain West, Conference USA, Sun Belt and MAC conferences. Also listed is the highest and lowest paid coach for each of the 10 FBS college football conferences. The conferences are listed from the highest average salary to the lowest. As you can see below there is definitely a pecking order for these conferences and coaches salaries. The average coach of a SEC college football team in 2017 is making $4.18 million dollars in base salary. 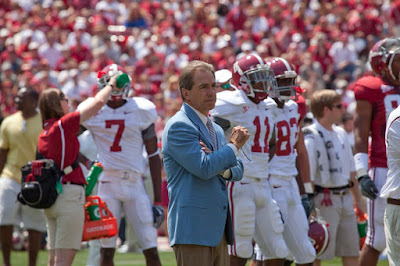 The highest paid SEC coach is Nick Saban from Alabama at $11.132 million. The lowest paid SEC coach is Matt Luke at Ole Miss who is making just $1.10 million on an interim basis as he took over for Hugh Freeze in a pinch. The average Big Ten coach is making $3.96 million in 2017 in salary. Jim Harbaugh from Michigan is the highest paid Big Ten coach at $9 million including a $2 million life insurance annuity. Tom Allen at Indiana is the lowest paid at $1.82 million. The average PAC-12 coach is making $3.57 million in salary in 2017. Rich Rodriguez at Arizona is the highest paid at $5.632 million while Justin Wilcox at Cal is the lowest paid at $1.6 million. The average Big 12 college football coach is making $3.43 million in 2017. Tom Herman at Texas is the highest paid at $5.5 million, while David Beaty at Kansas is the lowest paid earning $1.6 million. The average ACC college football coach is making $3.40 million in 2017. Dabo Sweeney at Clemson is the highest paid ACC coach at $8.5 million (2nd highest for any coach), while Pat Narduzzi at Pitt and Dave Clawson at Wake Forest are tied for lowest paid at $1.83 million each. The average AAC college football coach is making $1.61 million in 2017. Chad Morris at SMU is the highest paid at $2.1 million, while Charlie Strong at South Florida and Randy Edsall at UConn are tied for lowest paid at $1 million each. The average Mountain West college football coach is making $1.02 million in 2017. Bryan Harsin (Boise State), Mike Bobo (Colorado State) and Jeff Tedford (Fresno State) are tied for highest paid coach in the conference at $1.6 million each, while Nick Rolovich at Hawaii is the lowest paid at $400,000. The average Conference USA college football coach is making $767,000 in 2017. Frank Wilson at Texas-San Antonio is the highest paid at $1.14 million, while Jay Hopson at Southern Miss is the lowest paid at $500,000. The average Sun Belt college football coach is making $614,000 in 2017. Mark Hudspeth at Louisiana-Lafayette is the highest paid at $1.2 million, while Doug Martin at New Mexico State is the lowest paid at $376,000 (lowest paid coach in FBS college football). The average MAC college football coach is making $521,000 in 2017. Tim Lester at Western Michigan is the highest paid coach at $800,000, while Lance Leipold at Buffalo is the lowest paid at $410,000. The big drop in coaches salaries in the conferences comes from the ACC to the AAC, where the pay drops by more than half. Still, the AAC is clearly the best paying college football conference of the five non-major conferences. AAC coaches make, on average, at least 50% more than any of the other non-majors. The goal for any college football coach is to try and get a job first but beyond that you want to try to move from the non-majors to a major college football conference where you will, on average, at least more than double your salary. What is the Average Salary of a SEC College Football Coach in 2017? What's the Average Salary of a Big Ten College Football Coach in 2017?